Unfortunately, many human actions (such as applying synthetic fertilizers and pesticides, plowing/tilling) transform soil into dirt. By destroying the essential microbes that live in soil, the world beneath our feet loses its life-generating abilities. Once dirt exists, plants require a human-supplied chemical cocktail. In dirt, plants become sick. They are exhausted by pumping a lot—up to 50 percent—of their energy into the soil, calling to their microbe friends for help without reply. The secret world beneath our feet is teeming with life that is essential to all life on our planet. 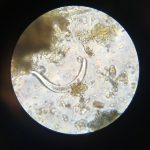 According to retired Oregon State University nematologist, Kathy Merrifield, “A single teaspoon of rich garden soil can hold up to one billion bacteria, several yards of fungal filaments, several thousand protozoa, and scores of nematodes.” One member of that living soil is the beneficial, bacteria-eating nematode seen here (left) swimming around the microscope slide. 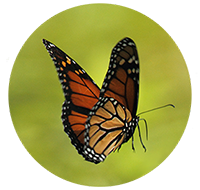 In soil, these predators eat bacteria and excrete plant-available nutrients. 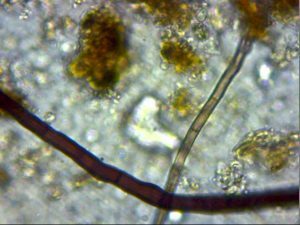 The two brown strands, as seen under the mircoscope, are beneficial fungal hyphae from healthy forest soil. They are small parts of the web-like network through which fungi eat, grow, and build relationships with other and plants. When soil is transformed into dirt, the complex systems that grow healthy plants, filtrate water, store carbon, and prevent erosion, are destroyed. Plants then rely entirely on artificial chemical intervention for their survival. We’re poor substitutes for the millennia-old partnerships that exist between plants and the soil. Article and images by Kassandra Brown, founder of Renaissance Soil and a graduate of the College of Agriculture and Life Sciences at the University of Wisconsin, Madison. Renaissance Soil was formed to spread excitement and knowledge about our underground ecosystem through classes, demonstrations, and citizen science research.